Shop our online collection of men’s real sheepskin boots and enjoy the warm and comforting feeling of our handcrafted shoes. With almost three decades of experience in this industry, Celtic & Co are experts in the development, design and crafting of men’s 100% sheepskin boots. Take our men’s Celt regular sheepskin boots for example, which are made in Cornwall using only the finest British sheepskin. Expertly finished with a contrast leather heel protector and hardwearing soles, they are now available in burnt honey, distressed black, grey and mocca. 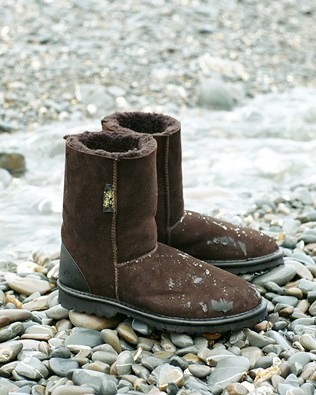 100% sheepskin with lightweight rubber sole, they are perfect boots to defy the elements. Or, why not choose our men’s Aqualamb boots, which come in a dark brown colour and are specially made to wear during wet and windy days. Their water resistant quality will help to keep your feet both warm and dry. If they happen to get muddy or dirty while you’re out and about, don’t worry because they can be easily cleaned with a damp sponge. As our men’s Aqualamb boots are so popular, we also have this particular design available in our women’s collection. Shop our online collection of real sheepskin boots for men now. Shop luxury men’s shoes from Celtic & Co. Our men’s shortie boots come in three beautiful shades, black, mocca and spice. A timeless footwear design, they have been crafted in the UK and are made with premium quality British sheepskin. With improved strength and shape retention, Celtic & Co men’s boots are made to withstand a range of harsh weather conditions while still looking stylish and keeping your feet warm, cosy and dry. Whether you’re shopping for yourself or for a gift for a loved one, browse through our online collection of men’s luxury sheepskin boots now.